Had quite the busy weekend this past weekend. I spoke at Tulsa Techfest on Friday and then SharePoint Saturday Dallas on Saturday. David Walker again did a great job at Tulsa Techfest. The attendance was huge and there were a lot of high caliber speakers talking about every technology you can think of. Tulsa Techfest is definitely a special event for me. It is the very first conference I ever attended to learn about SharePoint. Before Tulsa Techfest I pretty much hated my job and loathed SharePoint more than words can ever describe. 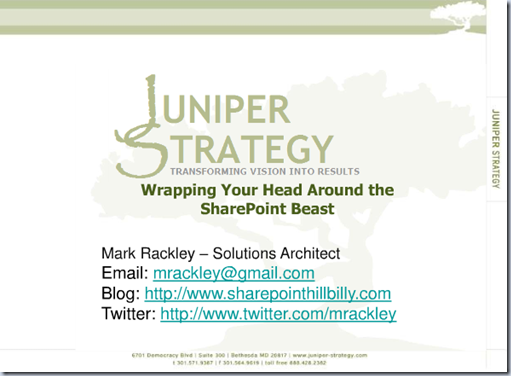 It was at that conference I realized people actually knew SharePoint and I was introduced to the community. I guess you can blame Tulsa Techfest for my blog, my presentations, and my Twitter rants… At least you know who to blame!! I didn’t get to stay too long but I got to say hello to SharePoint rock stars Cory Roth and Dennis Bottjer. Wish I could have stayed longer, but i had to get on the road for Dallas. Eric Shupps did an equally awesome job organizing SharePoint Saturday Dallas and I got to catch up with a lot friends and rock stars including Cathy Dew, Sean McDonough, Joy Earles, Tracey Nolte, Michael Hinkley, Becky Bertram, Kirk Evans, Brian Bedard, Victor Chataboon, and of course mr. Eric Shupps (if I forgot to mention you, please feel free to chastise me, I’ve had some Nyquil and feeling kinda loopy). I had a tremendous group of people attend my session. Lots of good interaction and questions. If my session is any good, it’s solely a reflection of those in attendance. Remember, I’m just eye candy. Anyway,below is the link to my slide deck from both events. Thanks again for attending my session and I look forward to making it back to Tulsa and Dallas soon!